Andre Fluellen has always had a bit of Kung Fu fighting spirit inside him. He dabbled in martial arts as a kid and was intrigued by Bruce Lee movies. But it wasn't until he saw another movie, the 2008 "Ip Man" recently that the Detroit Lions defensive lineman discovered an ancient and once secretive form of training he hopes will help set him apart. Fluellen stumbled upon the Detroit Kung Fu Academy during a Saturday-morning shopping trip. After one lesson studying Wing Chun, which combines grappling and striking, he was hooked. And with time on his hands during the NFL lockout, Fluellen has been able to focus on his new-found passion. "The first couple of days kind of humbled me because even the littlest women, the littlest people can knock me off my stance, knock me sideways or pull me down," he said. "I was like, 'How is this happening'? "The storefront studio has about 50 students -- none of whom match up with Fluellen's 6-foot-2, 295-pound frame. But size doesn't matter. Fluellen learned Wing Chun has more to do with technique than physical girth. His sifu -- or instructor -- Owen Matson, instructed Fluellen to not give up his centerline but rather, to protect it at all costs. Fluellen came to view training partners not as fellow Kung Fu pupils, but as offensive linemen, pushing him to perfect precision moves. Matson has seen Fluellen succeed at a form of Kung Fu other athletes struggle with. "This doesn't look like what's on TV," Matson said. "But Andre knew it would be different. He values the tradition, he values the training and he digs deep. I often leave it up to the individual student to see how hard they will push. He pushes hard." During a standard training day, Fluellen may take between 5,000 and 10,000 punches -- which he equates to fending off a similar number of blocks. In time, Fluellen, who has registered 2.5 sacks in four seasons, anticipates Wing Chun will lead him to more success on Detroit's defensive line. 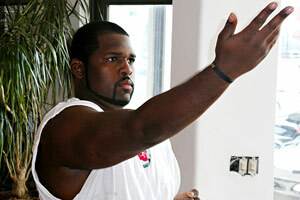 'When I learn the structure of Wing Chun, there's no telling what I will be able to do to offensive linemen," he said. "But I don't think you will see this catch on [with too many teammates] unless I come back with something like eight sacks this year." Detroit Lions lineman Andre Fluellen takes between 5,000 to 10,000 punches each training session.